It’s estimated that the average household in Australia throws out over $1000 of food per year. And it’s easily done. Left overs on a plate are thrown out at the end of a meal. Families are over busy and items in the fridge go mouldy in the rush. Diet fads change and food needs are replaced. Food items sitting outside the fridge too long. Uncertainty of use by and before dates. Lunch boxes with crusts and soggy items brought back from school. All of this contributes to food wastage. Now let me put it another way. Would you place $1000 from your purse to the rubbish bin? Ouch right? You wouldn’t and yet we are so relaxed about throwing food, which hurts our opportunity to save and create wealth. In the past 6 years I have become aware of food I throw out. After researching on the internet and discovering people who are making conscience changes in how they manage their wastage, I was determined to do something about mine. I reduced it and found that some food items I was discarding was actually nutritious food in other countries or ethnic groups. So yes – some items you are tossing out, I am cooking up for health, wealth and a better conscience. Here is an example I have for you today. A few days ago I was gifted a beautiful juicy watermelon that was grown on a local farm. My family has been eating and juicing the ruby red flesh and leaving behind mounds of rind. However in my internet travels I have learnt that many people juice the white rind and green skin for nutritional benefits. And in countries such as India it is used in vegetable curries. Other countries stir fry watermelon rind and pickling is popular too. 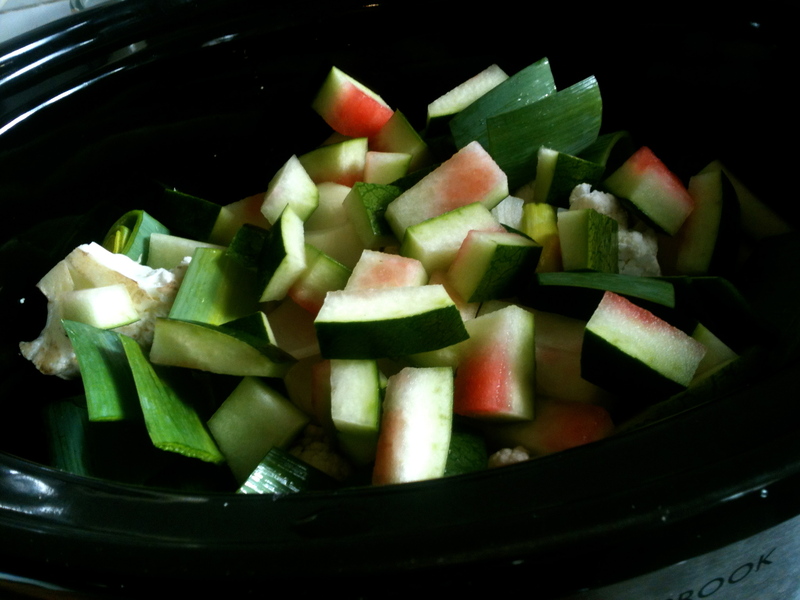 So instead of filling up my compost bin I slice and cook it. It has a lovely sweet taste reminding me of a mix of cucumber and choko. So take some time to think before you throw food out, on how the waste really affects your bottom dollar and think outside the box. Find out if those leaves, stalk or skin are really rubbish or a flavoursome addition to a meal.